Can be used as replacements for mechanical relays. 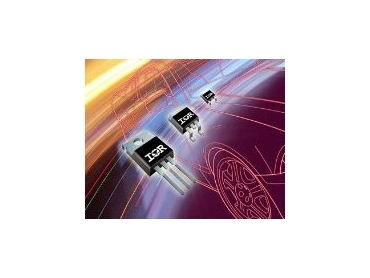 INTERNATIONAL Rectifier (IR) has introduced the IPS10xx family of low-side intelligent power switches (IPS). The devices are qualified to Q100, making them suitable for harsh automotive environments and any other applications that benefit from additional ruggedness and reliability. The new IPS line includes the IPS1011R, a 13mΩ device in a D-Pak that enables circuit designers to pack more current-handling capability into existing board layouts. In addition, the IPS devices include protection and a logic-level input and diagnostic information pin to monitor or detect faults during operation. Signals from this pin can be fed back to a microcontroller to trigger a specific sequence or restart strategy following a fault condition. Intelligent power switches are used in many automotive electrical systems, from engine components such as transmission and gearbox solenoid drivers, to comfort, convenience and safety features like power seats, window lifters and HVAC and windshield wiper controls. The industrial market has found use for these devices in applications where the integrated protection and gate driver provides space and component savings, for example traffic signs and vending machines. The low-side family features all the standard protection features generally found in protected switches, namely over-current, over-temperature, ESD protection and active clamp. Protection features are required in order to help protect the electronic control unit (ECU) and the application circuit from damage if a short circuit or an overload condition occurs. Although each circuit in a wiring harness could include traditional fuses or circuit breakers for protection, the IPS10x family of devices can simplify designs, reduce weight and increase reliability. IPS products can also be used as replacements for mechanical relays and in some applications, additional fuses or circuit breakers can be eliminated.